The morning of out latest "Great American Vacation" giveaway began with Mount Rushmore shrouded in the pre-dawn darkness; it wasn't long before the sun rose over the hills illuminating the mountain in a golden light. 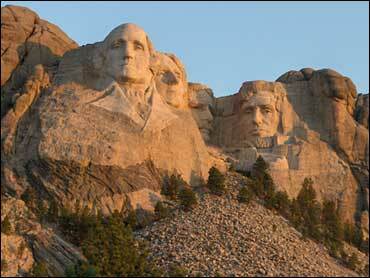 Shining in all their glory, the giant faces of the four presidents watched over the morning's festivities. Known to the Lakota Sioux as Six Grandfathers, the mountain was named after prominent New York lawyer Charles E. Rushmore in 1885. On hand to explain the history of the monument and the Black Hills was Gerard Baker, who in 2004 was named the first Native American superintendent of Mount Rushmore National Memorial. Dave Price was surrounded by a friendly crowd of South Dakotans, Native Americans, locals, and a host of bikers en route to the nearby Sturgis Bike Rally. He had his hands full of hog — cycle, not animal. We all had plenty of fun as he rode off into the sunrise aboard a Harley as part of our salute to the 67th annual event. Adding a great deal of local flavor to the morning were the Lakota tribal singing group and the reigning national hoop dancing champion representing the spirit and culture of the Native American people indigenous to the Dakotas and Rapid City in particular, which nearly 20,000 Lakota call home. Experiencing their spirited song and dance reminded us of a time past when these hills were theirs. To be here you can feel that the spirits of their ancestors are still alive and will live "as long as the river flows and the eagle soars." The Black Hills of South Dakota are considered "the heart" of the nation by the Lakota tribe, who have called the Dakotas home for more than 300 years. The Lakota tribe considers these hills sacred and speaks of "Cokata gli Najin" or "returning to the center" when describing the Black Hills. Because the Black Hills are sacred to the Lakota, they objected to mining in the area, which had been attempted since the early years of the 19th century. Mount Rushmore has been controversial among Native Americans since the United States seized the area from the Lakota tribe after the Black Hills War (1876–77). The Treaty of Fort Laramie from 1868 had previously granted the Black Hills to the Lakota in perpetuity and exempted all white settlement forever. "Forever" lasted only four years, as gold was discovered in the hills. Though considered sacred by the Lakota, historians believe the Lakota also gained control of the hills by force, displacing the Cheyenne in 1776. While the monumental granite sculpture represents the first 150 years of American history, it has been alleged that the monument also has an underlying theme of racial superiority legitimized by the idea of Manifest Destiny. The selection of the four presidents further fuels the controversy, in addition to being a matter of heated debate at the time, the fact that they were all in office during times of the acquisition of Indian land adds to the discussion. Controversy aside, Mount Rushmore is a grand and cherished National Monument, and the Black Hills of South Dakota should be a must see for anyone touring this great land of ours.